Submit yourselves, then, to G'd. Resist the d'vil, and he will flee from you. Greetings from Shanghai! The last time I posted, there was a huge emotional breakdown and tough experience that was causing me to surrender and learn how to make Chr'st my sp'ritual foundation in all that I do. Apart from Him, we can truly do nothing. Apart from Him, things ultimately lead to disappointment, dust, and death. If you seek Chr'st in all that you do, he will always renew, refresh, and bring life to what you do. Pr'ise G'd for who He is and how much He wants to be involved in our lives and in the lives of those around us. The start of my month began with just a great time to travel to Hong Kong. Although the trip was short, I was particularly thankful for the chance to read an entire book during my flights and travels and just refocus sp'ritually and mentally! :) It was also great to see friends on my travels! My parents and I when they visited me! Having my dad around was wonderful. He is a thoughtful and patient counselor and I really appreciated the talks I had with him and how he helped me reflect on my time here. My mom renovated and cleaned up my house and there was even a time to pray and write letters to each other as an encouragement to how much G'd has just richly provided for me here. 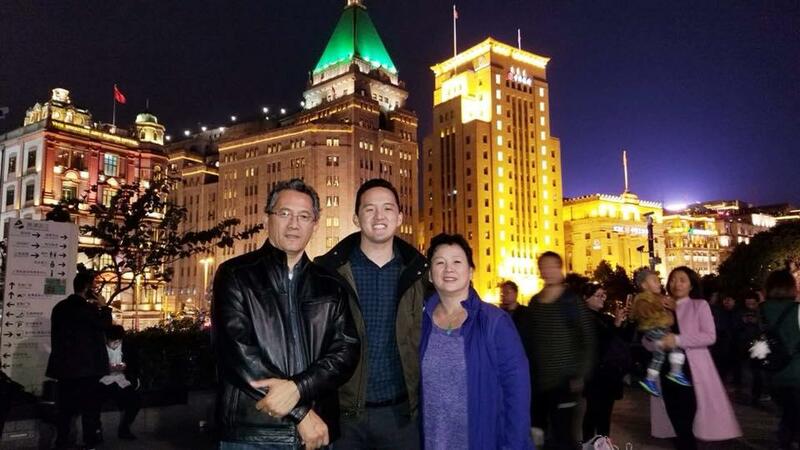 I was especially blessed by how well my mom spoke Chinese and humbled by her sociability and and willingness to love and talk to everyone she met in China (irregardless of socio-economic taboos and customs). My head p'stor really wanted my mom to consider staying because she would be such a blessing to our community here. This month gave me opportunities to finally check out some of the m'nstries being done and to join my ch'rch in serving the community here. Healing Homes is an orphan m'nistry that helps disabled children with surgery and adoption. There are countless, neglected children in this country that live in poor environments, but Healing Homes seeks to show G'd's love to these kids and I was just really blessed to be a part of it. It's really easy to volunteer to help play with these kids so I hope to go again very soon in the future! The Migrant School that I had a chance to visit was particularly gut-wrenching. In Shanghai, there are roughly 500,000 migrant students who come from families that are doing the menial and tough tasks in this city. Millions of Migrant workers come to Shanghai looking for employment but they are often undocumented and cannot enroll their children in normal schools. My ch'rch does a m'nistry called "Giving Tree" which provides gifts and toys to these young students. Many of them do not receive gifts ever and you can see their absolute joy in receiving books, toys, and clothing. I was particularly challenged by my middle schoolers who pointed out one of the gifts that she packed for the students. She knew exactly which toy was in there and she felt so blessed to see a young kid finding joy in her gift. It reminded me to be more generous and willing to recognize that we are all sp'ritually outcast and orphans before Chr'st found us. I really had a blast this Thanksgiving here. We had a church-wide hotel dinner with all the Thanksgiving trimmings and I was able to play music, dance, and act in various productions, while getting to know my community better. On the day after Thanksgiving, my youth group hosted a Thanksgiving Dinner and I was once again blessed by my fellowship's willingness to lead and serve one another. The night wasn't perfect and I feel like I am still learning a lot about servant leadership and logistics as a pastor. Please pr'y for my leadership and how I serve these kids. Please pr'y that I continue to grow as a shepherd! Against Sp'ritual Warfare - Please pr'y that I continue to put on the Armor of G'd on a daily basis (Ephesians 6). Sp'ritual Warfare is real and this country is a very dark place, particularly in Shanghai. People are lonely and isolated, they are pursuing worldly riches and are getting lost as they do so. If you want to be a believer here, there are many things that can discourage you from growing. Some of my students see d'mons and have a lot of hidden s'ns. For Protection against Discouragements - There are so many discouragements on a day-to-day basis. Some are based on my own slothfulness and s'ns, some are based on how people view me as a leader here, and others just come from disappointing myself. Pr'y that I find deep encouragement in how much G'd loves me and that there are daily blessings that get me excited for what J'sus is doing. Praise for an AMAZING SH community Here - My community is truly growing and I have found some deep and meaningful friendships here. My relationships with others seems to be getting deeper and there is a sense of blessing knowing that I have people I can turn to and be open with. Please pr'y that these relationships can bear fruit and help sharpen me in loving G'd's Word and His People.